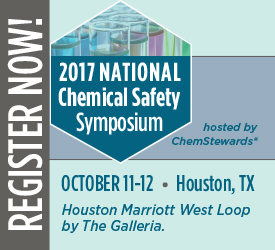 SOCMA’s National Chemical Safety Symposium – hosted by ChemStewards® is set for October 11-12 in Houston, TX. With a key focus on process safety, the Symposium features discussions on legislative and regulatory issues impacting the specialty chemical industry. Primary topics on the agenda include process safety, occupational safety, operational excellence and regulatory compliance, by way of presentations, panel discussions, networking and Q&A sessions.